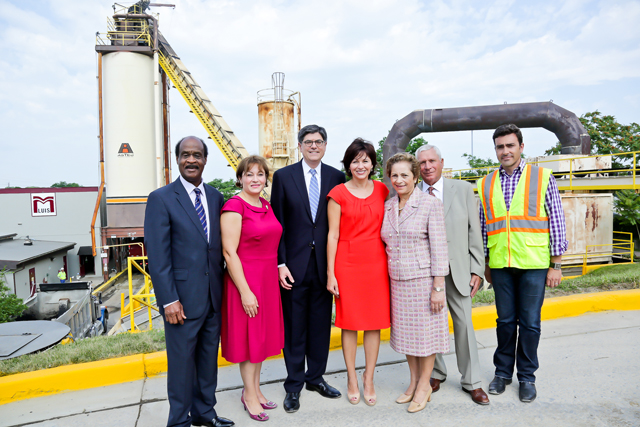 BALTIMORE, thumb buy cialis health MD – In celebration of National Small Business Week, cialis sale M. Luis Construction hosted Treasury Secretary Jacob J. Lew at their Rockville, Maryland asphalt manufacturing plant. Secretary Lew toured the plant with Montgomery County Executive Isiah “Ike” Leggett and highlighted the role of small business owners in jumpstarting the nation’s economy. Secretary Lew chose M. Luis, an asphalt and construction services company, to emphasize the critical contributions of entrepreneurs and immigrants. The Luis family immigrated to the United States in 1979 and founded a road construction business with little more than a pickup truck. The business now employs over 200 people and generates $60 million in annual revenues. “We are a nation of immigrants. We’re a nation where entrepreneurship has come from people coming to our shores, having an opportunity and building a life for themselves, their families and their communities. … Twenty-five percent of the small businesses in America are started by immigrants and 25 percent of the high technology firms. That’s what our future growth is all about,” Secretary Lew said. M. Luis was awarded a $2.5 million Maryland Industrial Development Financing Authority (MIDFA) loan guarantee made possible by the State Small Business Credit Initiative (SSBCI). The guarantee and Eagle Bank, a local community bank, enabled the company to continue to expand operations and vertically integrate the previously construction-focused company with asphalt and aggregate manufacturing. “We’re proud of the company’s accomplishments and honored to have Secretary Lew visit. It shows the importance of industry-government partnerships and the exponential impact that loan programs can have,” said Cidalia Luis-Akbar, M. Luis owner and president. Since purchasing the Rockville asphalt plant in 2010, the company has been on a steady growth trajectory, now offering quality products and services through three core divisions: Asphalt & Aggregate Manufacturing, Construction Services and the newly-launched Hydrovac Excavation. “As the economy continues to recover, we expect to continue to invest in job growth and infrastructure in our region,” said Natalia Luis, M. Luis owner and vice president. Later this year M. Luis will be expanding again, launching a Quality Control Testing Services division. They have a proven testing track record – in 2010 they became the only company to offer a state-certified mobile asphalt testing unit in Maryland. U.S. Treasury Sec. Kicks Off Small Business Week in Md. Inmigrantes que cumplieron el sueño americano. Las hermanas Luis comparten el secreto de su éxito en la Semana Nacional de los Pequeños Negocios.